Lucy (2014), R, 90 minutes - I don't know about anyone else, but when I first saw the trailer for this film, I thought to myself 'that sounds like Limitless with Scarlett Johansson instead of Bradley Cooper'. 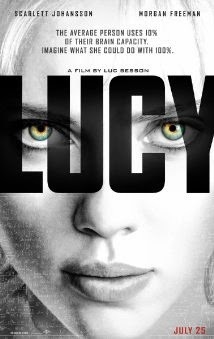 Of course Cooper's character willingly took drugs whereas Johansson's does not, but with Lucy, director Luc Besson explores the same basic concept of a person becoming able to access the entirety of their brain functions. Lucy (Johansson) begins the film as an American student in Taipei. After a crazy night out with her new boyfriend Richard (Pilou Asbaek), she's forced into being a drug mule for his employer Mr. Jang (Min-sik Choi). Mr. Jang is planning on distributing a new synthetic drug across Europe. CPH4 increases the user's ability to access their brain's functions (the average human only accesses about 10% normally). Before she is able to get her flight out of Taipei, an altercation causes the bag of CPH4 in her belly to rupture, flooding her system with the drug. When she comes to, she immediately begins to feel the effects of the CPH4 in her system as her senses become heightened and she is able to escape her captors. These scenes are spliced together with scenes of Professor Norman (Morgan Freeman) giving a lecture on the human brain and the theoretical abilities that could be unlocked if one were able to access their higher brain functions. In typical Luc Besson fashion, the rest of the film keeps up the swift action-packed pace. Lucy focuses on self preservation as she works with Professor Norman to learn and understand as much as she can about what is happening to her as well as with local law enforcement official Pierre Del Rio (Amr Waked) in efforts to keep the CPH4 out of Mr. Jang's hands. The concept for Lucy is quite intriguing. She develops the ability to have absolute control of herself and others, even being able to manipulate time in a way (this is shown in the trailer so I'm not getting too spoilery). I loved that her quest became that of gathering as much knowledge and understanding of her surroundings as possible, then shifted to the preservation of that knowledge. I was a little disappointed however with the 90 minute run time. I feel as though it severely limited the opportunity to properly explore some of the theorized abilities that Lucy developed. It definitely made for a tight, fast paced action flick, but at the same time it seemed to gloss over some things that could have given the film even more depth. Don't get me wrong, it is an entertaining film, I just think that it didn't reach its full potential. Who knows, maybe Besson left it that way on purpose? Either way, it is certainly more thought provoking than your standard action flick so that's a plus. - Min-sik Choi looked very familiar to me, but I couldn't place him at first. Among other roles, he played the primary character in Oldboy (2003), Dae-su Oh. - One scene actually reminded me very much of Oldboy - Mr. Jang's penthouse suite in which the drug mule plan began - I'd be curious to find out if it is another connection to Oldboy or just a coincidence. - It would have been nice to see more physical badassery from Lucy. After she escaped her captors, just about all of her abilities were mental, and while they looked cool it just seemed like she jumped ahead to telekinetic manipulation very quickly. - The spliced in National Geographic-like scenes at the beginning were an interesting choice. They felt a little out of place but clearly mirrored what has happening to Lucy. - I preferred the portrayal of increased brain function control in this film to that in Limitless. Taking nothing away from that film, it showed Bradley Cooper's character using his abilities for strictly selfish purposes whereas Lucy showed the quest for knowledge. Then again, Lucy had a finite period of time to work with. Who knows how things may have played out if her circumstances were different.